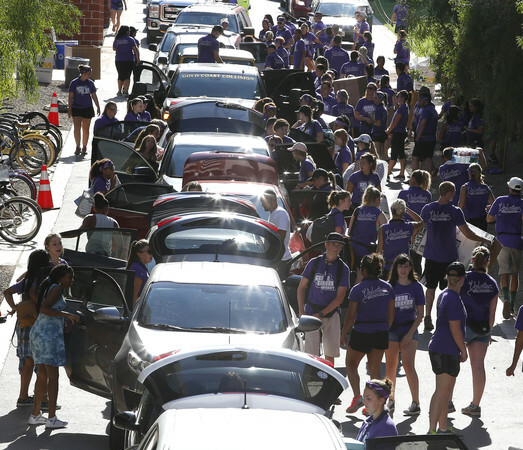 Four days of Move-In, the most in Grand Canyon University history (until Friday), are in the books, and a lot has been learned about GCU’s intrepid student and employee volunteers for Welcome Week: Early mornings and the blistering afternoon heat have little effect. Morale and enthusiasm are in seemingly endless supply. And selflessness flows through veins pumped by servant hearts. 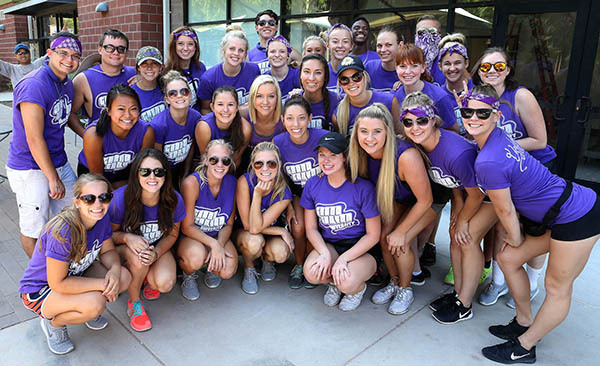 Ask any of the nearly 1,900 student and staff volunteers who have worked tirelessly unloading cars, hauling heavy luggage, directing traffic or welcoming new faces to campus from before 7 a.m. to the early afternoon this week and you’ll hear the same reason why they do what they do: It’s the GCU way. Junior Mary Khorany is volunteering at Welcome Week for the second year and said the servant message behind Move-In makes the heat and heavy lifting worthwhile. It’s the selflessness of the volunteers that makes Move-In special, she said. Students make up nearly 80 percent of volunteers, but people from all over the University have helped make this year’s Move-In the best ever. President/CEO Brian Mueller, numerous athletics teams and faculty and staff from nearly every department have chipped in. Charity Norman, student engagement coordinator, assembled the volunteers and is blown away by the response. 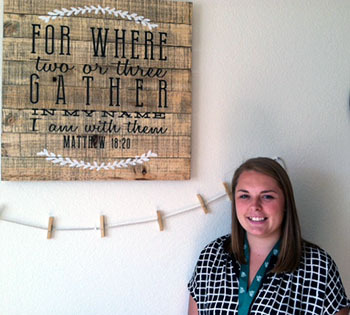 This week, her first Move-In, has justified why she chose GCU. 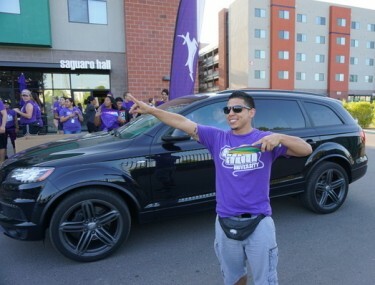 Junior Fernando Garcia directs traffic outside Saguaro Hall. The extra days are beginning to take a toll on volunteers, but students are staying motivated by starting chants or breaking into dances. Fernando Garcia, a junior physical therapy major and member of the cheer team, may have a little more spirit than most, but he said students are keeping the energy high. Coffee, plenty of water and a community of support make it possible. A less organized person would have dropped one of her hats this week while juggling the needs of thousands of new students during Move-In. Michelle Lavin wears four of them — resident assistant, student worker, volunteer and student — but none came close to dusting the ground during Welcome Week. Michelle Lavin is at home, briefly, in her room at Ironwood Hall, where she is a resident assistant. Lavin’s week began at 7 a.m. Monday at The Grove, where she checked in new residents for nearly 10 hours. As an RA on the fourth floor of Ironwood Hall, she greeted many of her new charges and helped keep things cool, even as the temperatures on the floor climbed into the 90s. Lavin, a student in the College of Nursing and Health Care Professions, launched periodic dance parties on the floor by blasting music into a speaker and encouraging students and parents to bust a few moves. Lavin spent part of Tuesday lugging luggage and directing traffic as a volunteer at Willow and Juniper halls, also in The Grove. The volunteers had their teamwork down to a science, and parents’ cars were in, unloaded and out in as little as three minutes. On Tuesday afternoon, Lavin’s student worker shift in IT Digital Systems started, and she helped set up speakers and lights in GCU Arena for orientation and the worship service and at the residence halls for pizza parties. Wednesday was a day of rest, before more check-ins at Ironwood Thursday and luggage lugging at Papago Apartments Friday. John Berkheimer, supervisor of IT Digital Systems, said Lavin is the RA/student worker/volunteer we’d all like to have: skilled, reliable, happy to help. Give her a job and don’t worry about it. For members of the men’s basketball team who are on campus this week, Wednesday was a day off from voluntary weightlifting workouts. Well, not exactly. Ryan Majerle, Matt Jackson and Gerard Martin wanted to help at Move-In, so there they were outside Prescott Hall, sweating alongside everyone else. “We just wanted to pitch in,” Majerle said. Which would they rather do, “suicides” — the grueling cardio drills that every basketball player runs a few thousand times every season — or carry refrigerators? Nearby were members of the dance team, fresh off two victories (jazz routine and Leadership Award) in the Collegiate Universal Cheerleading and Dance Association Camp last week. They weren’t hard to spot — even though they were on their third day of Move-In duty, they delighted in dancing to the blaring music when they weren’t emptying cars. “I feel pumped, actually,” Maddie Lynch said. “The music helps,” her teammates chimed in. So does having that kind of energy. 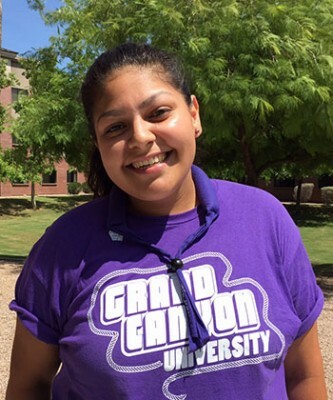 Volunteering comes second nature to Olyvia Zamudio, a GCU Life Leader. The 20-year-old junior spent most of Tuesday helping freshmen move into new residence halls in The Grove. Up and down the elevators and stairs she went, toting belongings and hauling carts. “It’s all a blur,” she said hours later, heading to lost and found in search of a favorite black shirt. With her warm smile and good-natured attitude, Zamudio helped students feel at home in their new setting. For some freshmen, it was their first time away from home. But her main role is as a Camelback Hall Life Leader who lends a loving ear to others going through a tough time spiritually. Life Leaders hold weekly Bible studies and generally make themselves available to offer spiritual support and counseling. She enjoys sowing the seeds of faith into the hearts of those searching for answers. One was a friend she had during freshman year. Not all the heavy lifting during Move-In is done by students and staff lugging refrigerators. Jeanne Lind’s work is just as challenging — and just as important. 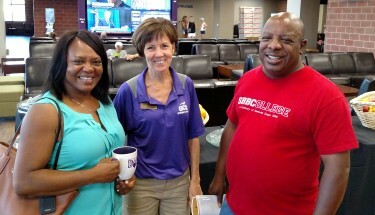 Jeanne Lind (center) took delight in meeting with parents this week — and they obviously enjoyed it, too. Lind, parent and family program coordinator for the Office of Student Engagement, arrived on campus at 5 a.m. Monday through Wednesday to help set up traffic cones and do whatever else was needed, then was on the second floor of the Student Union from 10 a.m. to 5 p.m. for the Parents’ Hospitality Corner, where she was available to answer their questions while they munched on snacks or sipped coffee. She got as much out of it as they did. Lind said it reassures parents when they hear that her daughter, Maggie Currier, graduated from GCU and works in the University’s events department. Eight members of GCU’s Information Technology department were hauling bags Thursday outside Saguaro and Sedona halls and Papago Apartments in the heat, humidity and humanity, far from cubicles, cords and computer screens. Among the several IT employees who left the comfort of their offices and helped with Move-In Thursday were, from left, Caleb Filz, Stephen Gee, Chad Troxel and Stephen Lemster. 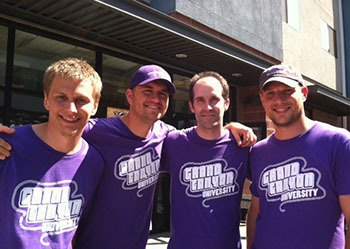 IT Director Stephen Gee said the team has been represented at Move-In for several years. It’s a good way for them to meet and greet students who might want to work for IT during their time at GCU. They met one father who made the 20-hour car trip with his student from Washington state and did not stop overnight. He planned to say goodbye, get back on the freeway and head home. Maybe it had something to do with the heat. Emily Bergquist is one of a kind at GCU. Bergquist, 32, is faculty manager for ground faculty in the College of Education, the first employee at the University to hold this position. Wearing faculty sheriff badges pinned to their chests, eight faculty members joined Bergquist Monday, traipsing up and down six flights of stairs and lugging boxes and bags for incoming freshman. When not organizing volunteer activities, Bergquist organizes team meetings and gatherings, works on faculty development, engaging in collaborate activities, and more. Just call Vince Licciardi the Ricky Bobby of Move-In volunteers. He loves speed and has created a streamlined unloading process to get luggage from car trunk to dorm room at lightning speed. Licciardi, a huge NASCAR fan, approaches Move-In like a mid-race pit stop, promising to unload each car in under 30 seconds. He and his volunteer pit crew of more than a dozen GCU student services administrators and admissions reps are one of the fastest unloading teams thanks to his system, which has been perfected over three years of volunteering. Licciardi, a GCU alumnus who graduated in 2007, experienced Welcome Week firsthand as a student. The event was one of the highlights of his college years and he takes pride in being one of the first people to welcome new students to campus. Licciardi said his system is designed to provide the same level of service he received when he moved to campus in 2005. As an enrollment counselor, he has helped a number of incoming students enroll and considers volunteering a job responsibility. Wow!! My daughter moved in to Juniper on Tuesday and we were all blown away by the incredible culture and atmosphere that filled the campus from all those amazing volunteers. Even the time sitting in the line of cars went by faster because of the excitement they were creating. We felt so blessed to be a part of it and my husband and I are so proud of our daughter for choosing GCU. Those luggage luggers were so fast and had our car unloaded and the boxes up to her room in minutes! It was truly an impressive site! Serving God was so evident in the heart of every volunteer and staff member we came in contact with. One of the volunteers that delivered boxes to my daughter’s room gathered the girls in her suite together and prayed with them. What a impactful way to set the tone for the year and say “GCU is a place where God is glorified every day in every way.” Thank you for an incredible Welcome Week. What a TREMENDOUS blessing it was to have Welcome Week Express Move-In for returning students! So grateful for all of volunteers, for the smiling faces and heartfelt “welcome backs” our daughter received yesterday. I wish I could hug every single volunteer or make them cookies or brownies or something. GCU is truly a place where being is a servant is taught and caught. SO GRATEFUL!!! 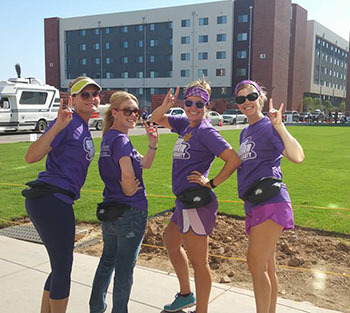 GO LOPES! This move-in experience was nothing less than AMAZING. I knew I was leaving my daughter in good hands. THANK YOU GCU!